"When The Church is Defiled"
The meaning of the verb "defile" is to cause someone to become immoral and corrupt before the eyes of God. The Pharisees poured out their strength to observe customs and laws in order to avoid this defilement. In the process, however, because of their insistence on those laws, they became hostile to Jesus and justified their actions which robbed people of God's mercy and forgiveness. They have lost sight of what it truly mean to be righteous before God; they blinded themselves from seeing the truth. The common denominator of the list of evil deeds Jesus mentions in v.21-22 is this: The mindset to insist on one's selfish actions at the cost of harming other people." The Pharisees, in fact, were blinded to the point to that they insisted on observing the Sabbath at the cost of denying Jesus' healing of the sick. This blindness of the Pharisees is a grave warning for the churches today. What is our truth about what it is to walk in purity before God keeping us from being defiled? It is NOT to make a list of what the church must do/not do according to their traditions, doctrines, and dogma. That which the church must do in order to keep themselves pure before God is only ONE. That is to love one another and to love humanity. As long as the church insist on loving others, it is without defilement. However, when the church abandons love, it is defiled, made immoral and corrupt before God. LOVE: Never forget. Always do. "The Purpose of Christian Life"
"Simon, Son of John" ... Losing Jesus to the Cross, disciple Peter goes fishing. Peter lost focus; he has lost sight of his purpose as Christ's disciple, and he went back to his old occupation that gave him some sense of meaning of life. In that sense, he was no longer Peter; he has returned to be "Simon, Son of John," a fisherman before he met Jesus. To this Simon, Jesus speaks, and calls him "Simon, Son of John." This was Jesus calling Peter anew, to give him a fresh start, and once again, start living to fulfill his purpose as the disciple of Christ. And Jesus begins to talk with Peter, and they converse back and forth as if something is being carefully elaborated in their words. Actually, the purpose of Christian living is revealed in it. 2) To Love others and lead them to Love Christ. If so, the guiding principle of Christian conduct is this: "I will do everything to deepen my love for Christ, and also to deepen your love for Christ." Christians will accomplish mission and fulfill the purpose of their existence by following this principle. And the Gospel will advance. "One - To which Jesus' Miracles Point"
"Where are we to buy bread, so that these people may eat?" Looking at the multitude of crowd, which was 5000 just by men, and may have been as many as 20,000 including women and children, Jesus asked his disciples. In response, they, along with Philip and Andrew, conclude that it would be simply impossible to feed the crowd with the resource they had at the time and at that place. Despite such reasonable and realistic conclusion that his disciples have drawn, Jesus performs a great miracle. 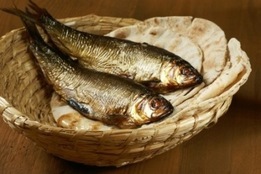 He feeds and satisfies the multitude out of only 5 loaves of barley bread and two fish, a bit of lunch meat. This miracle demonstrated God's love and grace towards His people, and that such love and grace flew through this one savior, Lord Jesus Christ. This miracle is a sign that shouts out, "Come here! This way! Look here!" The object is one person: Jesus himself. The story of this great miracle does NOT point to either the greatness of lack of disciples' (or our) faith. It does not seek to make us focus on ourselves and be imprisoned in our existential issues, making us either be proud of our own abilities or be depressed for the lack of thereof. The miracle, instead, encourages us to look away from ourselves and our limits, and to focus on Jesus, listening to him, believing in him, and to give thanks, glory, and worship to God the Father. By experiencing the miracle, we are lead to worship God. So, let us worship Him! "Live a Life Worthy of The Calling"
"The Power of Lord Jesus' Words"
Our salvation is accomplished by this single word uttered by Jesus. When Jesus commanded Peter to come to him, and invited him to his side, Peter walked on water. The power of Jesus' words, which has created the heavens and the earth and the universe, made Peter stand on water. It was NOT because Peter's faith was superb than others that he walked on water. It was because the power of God's words was working in him. The salvation of Christians depends on Jesus' words: His words initiates, realizes, and sustains salvation. Christians are free from making human efforts to increase his faith because he is already standing on water by God's power. That which enables men to surpass his limits: it is not human efforts or more sophisticated philosophies and ideas. That which enables men to step out of his boat, overcome his problems, break free from his inner prison of mind, and make him walk towards God is ... it is the power of Jesus' words as the Creator. Jesus calls us: "I have come for you! So, Come to me!" - May our ears continue to hear his voice!